What do walking, weaving, observing, storytelling, singing, drawing and writing have in common? The answer is that they all proceed along lines. 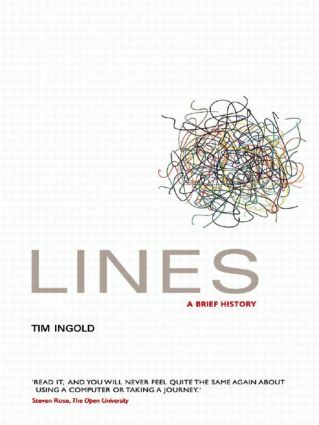 In this extraordinary book Tim Ingold imagines a world in which everyone and everything consists of interwoven or interconnected lines and lays the foundations for a completely new discipline: the anthropological archaeology of the line. Ingold’s argument leads us through the music of Ancient Greece and contemporary Japan, Siberian labyrinths and Roman roads, Chinese calligraphy and the printed alphabet, weaving a path between antiquity and the present. Setting out from a puzzle about the relation between speech and song, Ingold considers how two kinds of line – threads and traces – can turn into one another as surfaces form or dissolve. He reveals how our perception of lines has changed over time, with modernity converting to point-to-point connectors before becoming straight, only to be ruptured and fragmented by the postmodern world. Drawing on a multitude of disciplines including archaeology, classical studies, art history, linguistics, psychology, musicology, philosophy and many others, and including more than seventy illustrations, this book takes us on an exhilarating intellectual journey that will change the way we look at the world and how we go about in it.